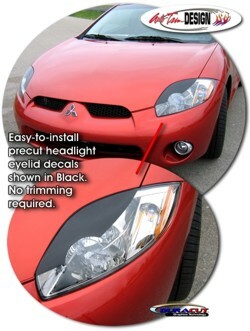 Give your '06-Current Mitsubishi Eclipse that "Mean" look with these precut "Eyelid" decals (no trimming required). Decals are uniquely cut to highlight your light's projector as shown. Kit comes with two (2) lids (one for each side) and is available in a wide variety of colors.